THE GRASS IS ALWAYS GREENER AROUND HERE. Enjoy effortless steering and speed control. 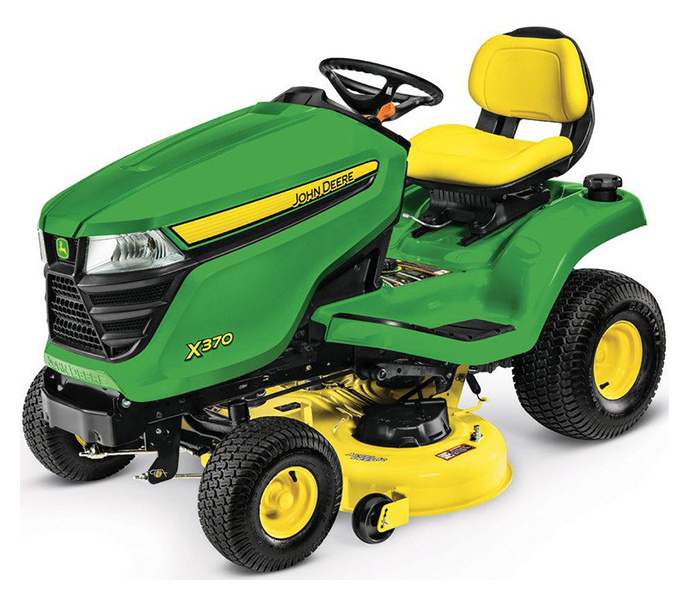 The X300 Series delivers all this (and more) with available four-wheel steering, and easy-to-operate Twin Touch™ foot pedals. A combination you won’t find anywhere else in the industry. Take the X370. Along with a 15-inch (38.1 cm) open-back seat, all feature power steering for precision turns and are equipped with power lift for handling heavy attachments with ease. The real power comes from the 18.5-hp* (13.8 kW) and 22-hp* (16.4 kW), iTorque™ Power Systems. And the optional MulchControl™ Kit makes feeding your lawn easy. So if you are looking for an easier way to get around everything in your yard, look no further. Controls are convenient and easy to find. Power steering enables easy turns. Hydraulic lift system is easy to operate. Integrated hydrostatic transaxle efficiently transmits power to wheels. Modern styling with functional design enhances appearance and performance.